This entry was posted in Drugs, Neuro, Psych and tagged pathway, schizophrenia by Ali. Bookmark the permalink. Ali- these are amazing! 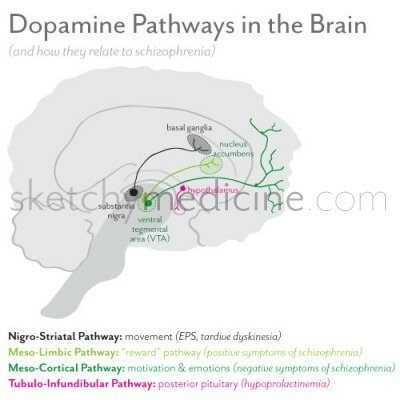 I just happened across the dopamine pathways to review for a lecture- SUPER HELPFUL! I’m going to finish studying for step 3 on your site because I can actually focus on it. Thank you!! I’m so happy that you find the doodles helpful! Spread the word, and if there are any topics you want to see, please let me know! Hello Ali, I made the exact same sketches in my notes, so Im really excited to find yours. Do you think you could do some on the mania pathways? Thanks for your comment and sorry for the delay, I was out of the country with no Internet access! Right now is a very busy time for me, but hopefully in the future I’ll be able to add some of the mania pathways! Is psychomotor agitation a symptom or a sign?